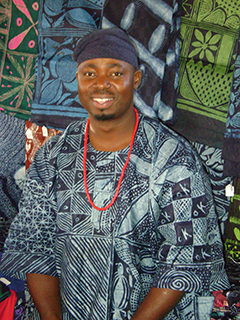 In this class I will teach the traditional Yoruba techniques of Batik, Adire Eleko, and Tie-Dye. 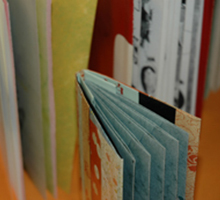 When teaching I always begin by telling the students a little about myself and my culture; I explain the meanings behind the designs I am teaching them and give a short demonstration of the methods before the students begin. I believe that batik is a way of creating so many beautiful colors. When I teach I always tell my students that when you first start your batik process and you want many colors, you should make sure you leave some space for the next color to be applied. Traditionally in Nigeria the dye used for batik fabrics is a dye called Jaman dye or Prosion dye, which are both colored dyes. However, indigo is currently the common dye used. 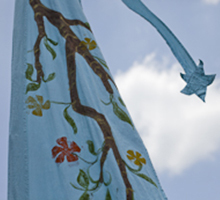 After the fabric has been dyed, the wax must be removed. When removing the wax from a piece that has been dyed, the fabric should be almost dry so that the color has time to set. To remove the wax, the fabric must be put into a large pot of boiling water to which 3 or 4 tablespoons of a mild, bleach free detergent has been added. After the fabric gets immersed in the boiling water for a few minutes it then gets placed in a large pot of cold water and gently agitated to remove any remaining wax. The fabric is then hung out to dry. 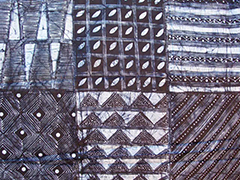 Adire Eleko is the process of creating designs using cassava paste (also called yucca), a small broom, and a chicken feather. 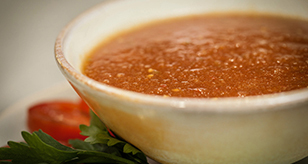 In this class we will prepare the paste together, so participants can do it themselves when they are home. 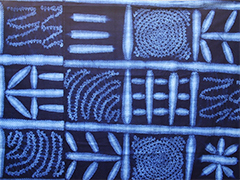 There are two techniques in Adire: the first is to use a stencil, and the second is to create the patterns by hand. 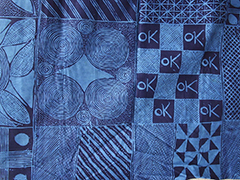 After the designs are created participants will then prepare indigo and use it to dye their work. Finally, participants will remove the cassava from their work. 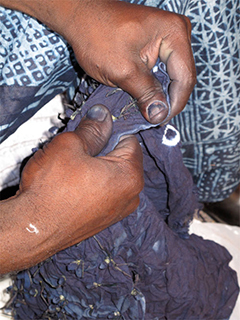 The primary dye we will use in this workshop is Indigo. Indigo has been used as a dye in Africa for at least 2000 years. 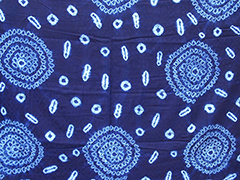 The Yoruba name for indigo is “elu”. Since the olden days indigo has been used for medicine as well as a dye; it cures an upset stomach. Indigo is also used to ward off viruses; houses are painted with indigo to prevent the sickness from entering. Indigo is an organic substance: it comes from the indigo plant which grows wild in Nigeria. During the beginning of the rainy season the leaves are harvested and then dried. After they have dried they are formed into little balls which are then used to prepare the dye. All levels are welcome in this class. My name is Gasali Onireke Adeyemo. I am the third born of five from a small rural village, Ofatedo, located in Osun State Nigeria. My mother is a trader and my father, a farmer. Although my family was rich in spirit and culture, we were poor in capital and I sponsored my own education throughout my years at St. George Elementary and Ido Osun High School. From a very young age, I realized my artistic potential and I would attend social gatherings, such as weddings, naming and burial ceremonies, and other cultural parties, offering to sketch portraits of the guest for a small donation. My sketching career combined with long, hard days working on the village farms provided adequate income for me to successfully complete my academic education through high school. In 1995, my long years of service and dedication to the Nike Center paid off, and my artwork was exhibited in Bayreuth, Germany alongside the work of five other artists from Nigeria. My work made quite an impact, and many people traveled to Osogbo looking for the artist named Gasali. People who were exposed to my work later commissioned me to do quilt work and other pieces, and my artistic career truly began to bloom. I come from an artist family, and my mother was my first teacher; she was the one who taught me how to prepare an Indigo dye pot. The techniques and designs that I use in my art have been passed from generation to generation and have special meanings in my culture. I am proud to continue the tradition and to not let the history in the art that I do disappear. Also, I encourage young artists in my village to follow their passion to be an artist and to show them that you can be a successful artist.